Are you fed up with treadmill workouts? 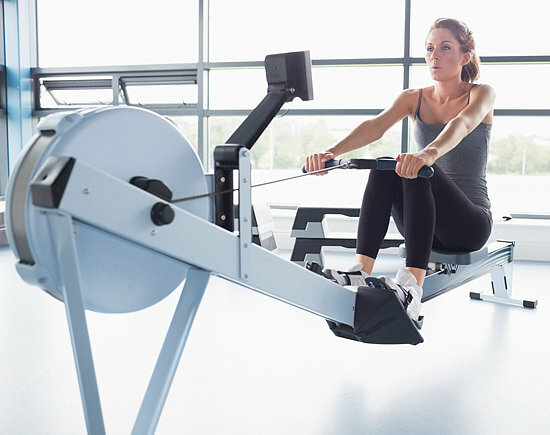 If you want to put an end to the monotonous treadmill experience and still want to achieve even better results, you need to step onto a rowing machine. Rowing exercises can definitely be described as one of the most beneficial cardio exercises available and best rowing machines truly mimic the original rowing experience to offer outstanding results. These machines engage your core, back, legs and arms to deliver a full body cardio experience and they reduce the stress on knees and hip joints to ensure minimal impact on your body. Many people think that rowing exercises offer benefits only for the upper parts of the body. It can be described as a wrong perception. The fitness experts are of the opinion that these exercises offer unlimited benefits for the legs and during a rowing stroke, the hip and legs take maximum effort to create the much needed power. The movement bears great resemblance to explosive power cleaning in weight lifting. First of all, you generate power using legs and then, activate the muscles in your core and back. Finally, follow through with your arms to enjoy unlimited benefits for the whole body. As a beginner, you should ensure that the strap goes across your foot’s ball. When you place your feet very high, your legs will also be kept at a higher position and this situation does not allow you to take full strokes that deliver excellent results. The incorrect leg position always leads to incomplete strokes and that is exactly why you should keep the straps of the rowing machineacross your foot’s ball to ensure the correct leg position. The damper setting can be described as aplastic lever that controls the air quantity in the flywheel. When the damper setting is kept at maximum, the best rowing machine offers an experience similar to rowing a heavy boat and you have to take maximum effort to perform every stroke. When you keep the damper setting at the minimum level, you experience something similar to rowing a light and sleek boat and, minimal energy is required to perform each stroke. Beginners should always focus on keeping the damper setting at a level that they feel comfortable and normally, it can be in between 3 and 6. The monitor of a top a rowing machine comes up with instant feedback during your rowing efforts. In the monitor, you can find a wide range of metrics to use. Initially, beginners should confine themselves to the most essential metrics. For example; they can focus on stoke rate and watts during the earlier stages. As they become experienced, they can start focusing on more complicated metrics. In order to warn up your body before rowing, you can perform a 10-minute pick drill and such a method of approach helps you wake up the muscles in the best manner. The best rowing machine manufacturers offer quality advice on all these aspects and you need to perform all rowing exercises by maintaining the correct body posture. It is absolutely essential to follow the correct guidelines because a wrong method of approach makes your efforts highly ineffective and you also become highly vulnerable to injuries. If you can perform the rowing exercises correctly with utmost dedication and discipline, you can achieve unbelievable results within a short period of time. What Makes Liberty The Most Trusted Name In Gun Safe Manufacturing Business?